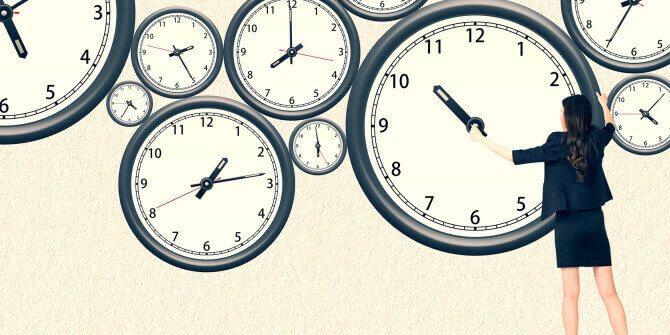 As February winds down seemingly as quickly as it began, I felt that the short month presented an opportunity to discuss time management and its impact on both our professional and personal lives. A fellow Project Manager was recently telling me about a new project she was heading up and the fact that, in its early stages, she’s feeling a little overwhelmed. I think we can all relate to the way she’s feeling, especially in the beginning when so much has yet to be done. It reminds me a little of the first day of class in college when the professor would hand out the syllabus. I’d take a look and see all of the assignments, the projects, the papers and the tests and think, “I am never going to get through all of this!”. I would, of course, as the work was spread over a four-month semester. Before I went running to the registrar to drop the class I needed to take a deep breath and realize that the syllabus was just an overview of what was to come – not all due tomorrow! The process of planning and exercising conscious control of time spent on specific activities, especially to increase effectiveness, efficiency or productivity. It is a juggling act of various demands of study, social life, employment, family, and personal interests and commitments with the finiteness of time. Using time effectively gives the person “choice” on spending/managing activities at their own time and expediency. Time management is a core function of project management and is something that must be a priority for successful project completion. The key for me when tasked with a large project, whether it was in school, at home or professionally has always been to break it down. There is an old riddle that asks, “How do you eat an elephant? The answer? One bite at a time!”, and it is exactly how I divide and conquer my projects – one bite at a time. Breaking down large tasks into smaller manageable chunks allows you to bring your focus in from the big picture (the entire project) to the small picture (the immediate task). Being a PM means being both farsighted and nearsighted while knowing which you need to be and when. It really is a simple idea that big goals/projects can be so much less intimidating if we just break them down into logical pieces. When managing a team I also think it’s also important to build in rewards or recognition for reaching the interim goals and to help keep everyone focused and motivated. It’s important to keep the momentum going because just around the corner will be another task waiting for attention. Also, I find it helpful to find a way to increase accountability for myself and my team by making the goals visible. As an example, at FlexPro the senior leadership team sets quarterly goals and keeps them visible to each other. This way everyone is on the same page throughout the process and there are no surprises later. Since I know there is more than one path to success, I’d love to hear any time management tips you’ve been implementing to help keep you and your team on track!